Greetings loyal readers it has been gasp! nearly two months since my last post; please forgive me. 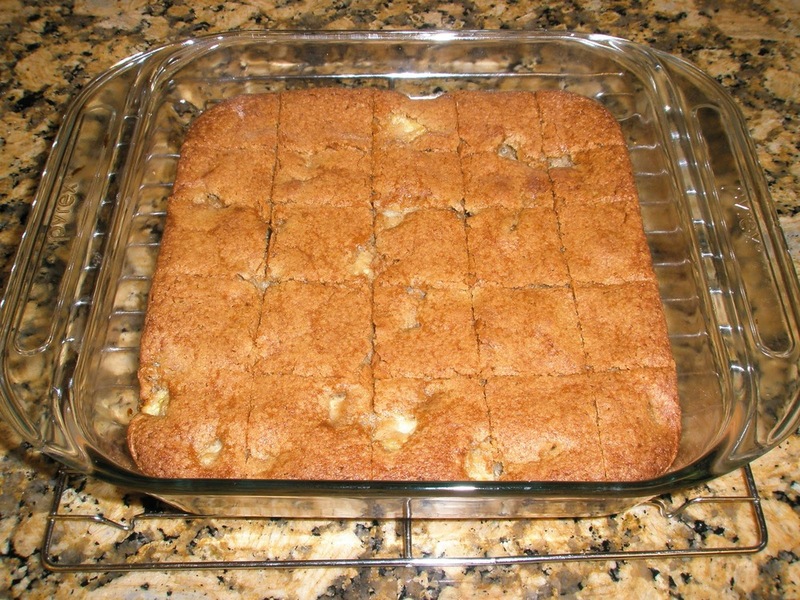 In an effort to win back your hearts and stomachs I am showcasing one of my most popular creations; Apple Brownies. Possessing the luscious texture of a moist brownie, and tasting like an apple pie this treat will please even the most ardent dessert connoisseurs in your company. Besides being out of control delicious they are also outrageously easy to make, and can be expanded or reduced to satisfy crowds big and small. I have served these delightful little gems at catering events, birthday parties, & to hungry roommates, and every time no matter how many I make they are gone in a day. They are so enticing in fact that I had to bake another batch of these guys just for this post; the initial batch was mortally wounded before I could even focus my camera on it. Melt butter and cream together sugar. Next beat in the egg and extracts. Pour 1/2 cup flour into bowl then add in the leavening agents and cinnamon; then add in the remaining 1/2 cup flour. Mix just until the dry ingredients are evenly combined with the wet. Gently fold in apples. Evenly spread batter into pan then place in center rack of oven and bake for 35-40 min. or until toothpick inserted into middle comes out clean. Allow to cool on wire rack for at least 30 minuets before slicing (you may need to exit the premises in order the accomplish this). I like to slice these into 1X1 inch squares because they are rich, but this only seems to increase the number of return trips I make to the kitchen; so cut them however you see fit and enjoy! Swapping in some plain yogurt for butter will lighten the overall dish by 300 calories/36 grams of fat, but also produce a more cake like texture. Both ways are delicious and I encourage you to go with whichever version gets your salivary glands going more.